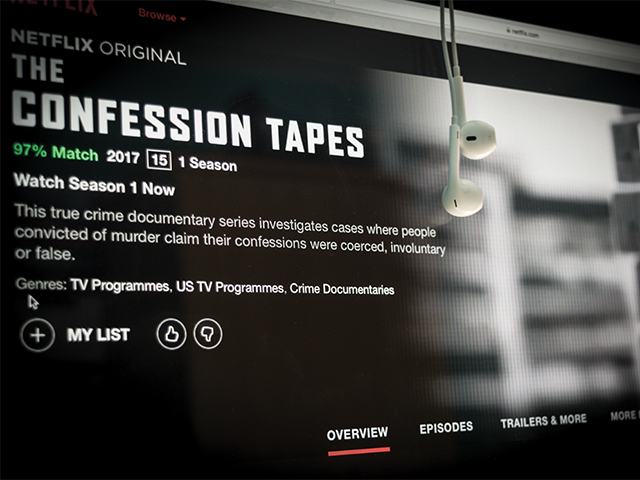 The latest crime documentary series released by Netflix, The Confession Tapes, will leave you on-edge and full of doubt. The documentary takes us through real life cases of false confessions. You could never imagine admitting to a murder that you didn’t commit; to killing your own daughter in a house fire, or murdering your entire family with a bat, until now. The Confession Tapes maps out not just how possible this is, but how often it occurs. This is not to say that all those we see convicted over the six stories were completely innocent. What links these stories is the fact that the perpetrators were all convicted largely based on confessions given in extreme circumstances. The series gives an insight into methods used by law enforcement in getting a confession; not all ethical, not all legal. It raises the question of where to draw the line in coercing people into confessing. In one episode for example, an FBI undercover investigation has an agent disguised as a mobster befriend a suspect over a period of time eventually coaxing a confession out of him. The agent led the 19 year old to believe the right answer was yes, he did kill those people. How deep is too deep to dig? The series makes the viewer think about the human condition and about how much control we actually have over our own selves. It shows us just how possible it is to convince an innocent person they did something terrible. In each of the seven episodes, intense manipulation sees suspects transitioning from “I don’t know” to “I don’t remember” to “well maybe…”. It can be grim and gaudy but you will not look away. What is more enticing than brutal murders and bloody crime scene photos? The use of original footage, recordings, and interviews brings home the fact that these are real cases and as shocking as it is, the American Justice System does work in this way. Amongst all the blood and guts, the series will pull on your heartstrings in the most confusing of ways. Listening to parents give accounts of their children’s time in prison all while not knowing whether or not they were guilty; watching the testimonies given by both the perpetrator and the families of the victims; hearing evidence and being convinced of one thing and then being shown just as convincing evidence from the other side will leave you a confused mess in 45 minutes. While the few reenactments allow the viewer to gain a better understanding of how the situation occurred, they can sometimes make it seem a little less realistic. When shown side by side with real footage they seem somewhat out of place. Despite the few awkward scenes of acting, the suspense and drama of this series will kill you. Or will it?